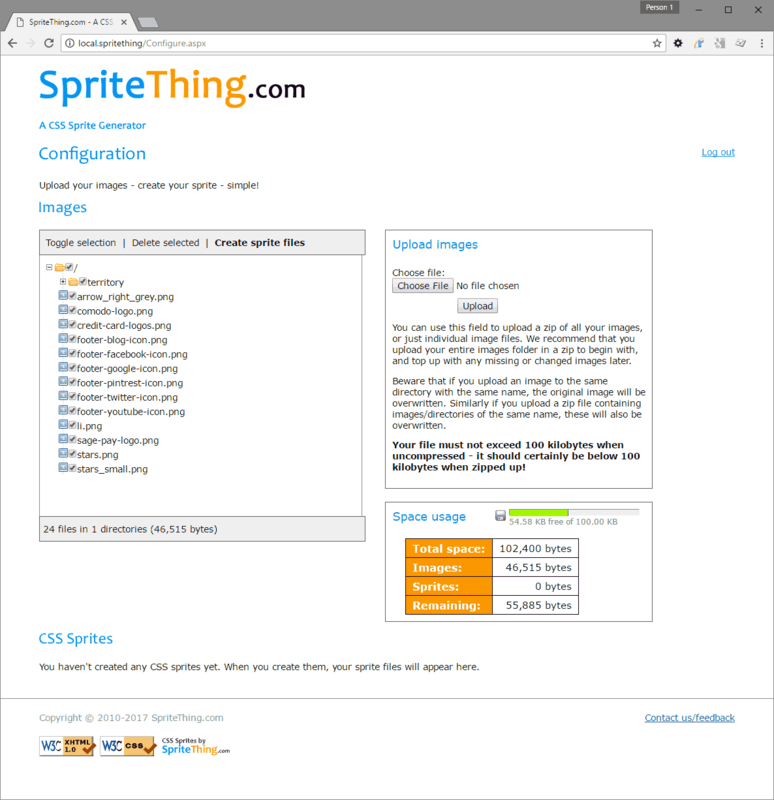 Sprite Thing is a tool which automatically generates a sprite image and its associated CSS rules from images you upload. Sprite Thing positions the images within the sprite file using a smart algorithm which tries to make best use of the space available, and each image is given a 1px padding to avoid rendering issues on certain browsers. You first need to create an account by entering your email address and inputting a password. Once you access your account, you can start adding images for your sprite. We set the initial storage limit on the account to 100KB (that's kibibytes, if you were wondering) to help keep our requirements low, if you need more space, get in touch. This 100KB includes the images you upload and the sprite files you create, but you do get leeway on this. If you upload 99KB of images, you'll still be able to create the sprite files. We recommend you zip up the images you require (you must place the images inside a folder within the zip file), and upload this. From the configuration screen, click to choose your zip file, then click the Upload button. The links in the CSS Sprites table allow you to preview the sprite image and its associated assets in a simple web page, you can also download the sprite image file and obtain the CSS rules. Rather than show an image of this, the test file is embedded in the following iframe. You can inspect the elements to see how they're put together. Sprite Thing creates a CSS rule for a class named spr (short for sprite), which sets the background image for use on sprite elements. In addition to this, a rule is set using the file name of each image, setting its background position and dimensions. If you would like to exclude certain files/folders from the sprite file which is generated, you can use the checkboxes to deselect any images you don't want, before clicking the "Create sprite files" button. Here is a list of improvements which are in the pipeline for Sprite Thing. Please get in touch if there is anything you would like to see! Managment of CSS rules applied to each sprite image for ease of management in deployment. For example, to automatically generate styles for utilising images with :before/:after rules, or applying same image to different class names. Handling multiple projects for separate sprite images, For example images which may be used on different websites, grouping elements, different sized assets for responsive sites. Linking multiple scale factor images to produce sprite files for use on devices with varying pixel densities. Manually override automatic image size calculation to dictate width/height of output sprite file. A tool for splitting previous sprited images into individual assets. Define repeat-x or repeat-y images which will automatically be sized to fit within sprite file confines (where appropriate). Better control of directory elements within configuration screen. Redesign configuration screen for improved user experience.